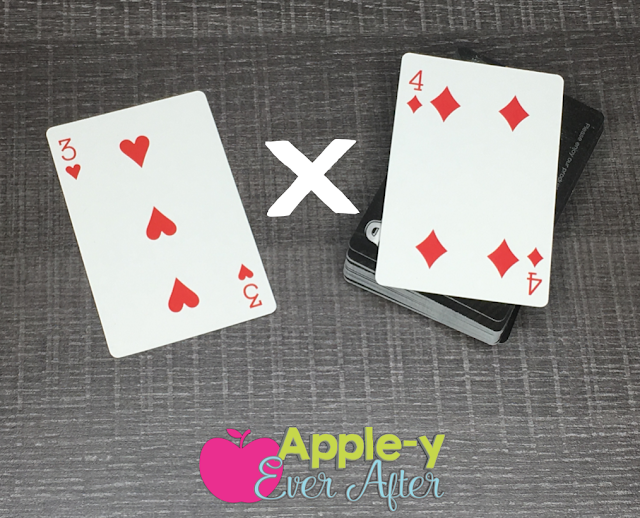 Multiplication Fact Fluency - 5 EASY Ways to Encourage Student Success - Apple-y Ever After! Who loves it when their students know their multiplication facts by heart? We all want to see our students being successful in the memorization of their facts and learning the strategies to help them to learn. 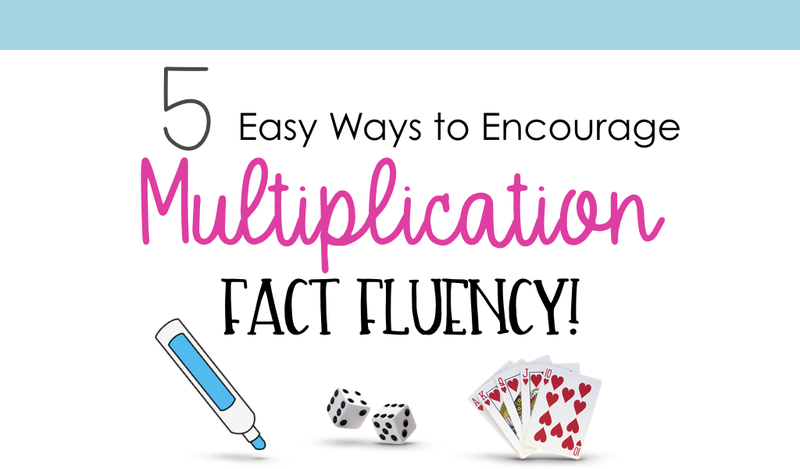 Here are a few ways that we practice fact fluency and how I have helped my students to become fluent in multiplication at school by using several different methods that encourage them to know their facts! These simple uses of counting are ways that many teacher uses already however by switching it to skip counting it sets your students up for success when they are learning multiplication. It is especially important in the beginning when students are using strategies for solving multiplication equations rather than having the answers memorized. Another way that we practice our fact fluency is to play whole class games! We have an interactive whiteboard that allows us to practice our multiplication as a whole class. This Multiplication Card Slam game is so much fun! My students BEG me to play this game. Once the file is opened you choose your multiple (from 1-10) or choose FRANTIC MODE (which has all the questions in a random order) and it automatically plays. This game is self playing and allows teachers to use that time to do something else that is on their list of never ending things to do. Watch these videos to get a better idea of how to play. Click here to check this game out! During guided math, my students go to 4 different stations. One of the stations is Math with Someone. During this time they play games 'against' their peers which focus on multiplication fluency. One of the games that they play is Multiplication Match Up. This game is great for students who are beginning to learn their multiplication facts because it allows them to check their answer in 3 different ways. This game begins by reading a story problem. Students need to figure out what the equation will be and find 3 ways to show the answers. They need to solve the puzzles by finding a matching picture, array and number. Another great way to practice your multiplication fluency is to use objects that are 'out of the box' OR 'out of the can' in this instance. 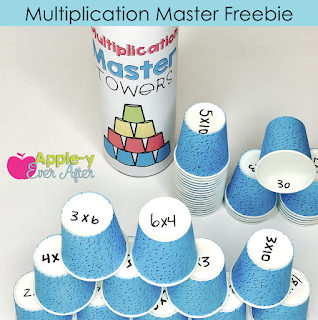 I took an old pringles can and some dixie cups and made this simple game called Multiplication Master Towers. 1.) Write your multiplication facts on the bottom of the dixie cup. 3.) Take the cover (which is a freebie at the bottom of this post) and glue it to your chip can. I had to put a small band of black construction paper on mine because it was too short using only paper on it. 4.) Voila! You have a new game for your class! 1.) Player 1 picks up the cup on the top of the pile and reads the equation then says the answer. 2.) Player 2 looks at the inside of the cup to see if the answer is correct. If it is, they get to begin the pyramid of cups. If it is incorrect, they have to put it back on the bottom of the pile. 3.) Students continue this rotation around the group. - Once this game is well practiced you can add in a timer or have 2 stacks in which the players will face off to see who can complete it faster. The next game that we play either independently, in small groups or as a whole class is super simple to do. I call it Multiplication Slam and it inspired the digital version of the game that you saw above. 1.) Grab a deck of cards and remove all the face cards. 2.) Choose your multiplier and place it face up on the floor or table. 3.) Flip over a card that you have on the pile. 4.) Each student takes a turn multiplying it around the circle. If they get it right the first time, they get to keep the card. 5.) The student with the most cards in the end wins the game.